was inspired by colors of Morocco when we visited last year: red flags, pisse ksaur walls, green countryside in the Fes and Meknes area, and a turquoise reservoir in the Sahara. Afa Gallery is in downtown Scranton PA (514 Lackawanna Ave). Opening reception is Friday, July 1, 6:00 to 9:00 p.m. (Food is always good at Afa receptions!) The gallery is also open Thursdays, Fridays, and Saturdays from noon until 5 p.m. 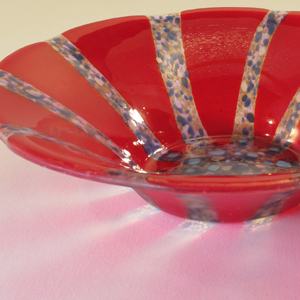 Meanwhile much more of our work, both fused and flat glass, will remain on exhibit at B’s Floral and Gifts, 131 Penn Ave, Scranton, until July 6.